On May 29th we woke up bright cloudy and early and headed into the city center of Salzburg via the bus. It was cool out and slightly windy but not terrible. We crossed over the bridge to the Bob's Tour office for a tour I was really looking forward to... SOUND OF MUSIC!! We had booked the Sound of Music and Hallstatt all day tour during our trip planning. There are many companies that do Sound of Music tours but we liked this one because it was small groups of 8 and we could also see the town of Hallstatt. Our tour just had 7 people (the four of us, an older couple and their daughter who was a little older than us) and our tour guide Martina in a minibus. We started off by driving around the city center area while Martina gave us some historical info about Salzburg and also talked about the Sound of Music filming locations in the city center like the gardens. After our drive in the city finished, our fist stop was the Von Trapp movie "mansion" in a suburb outside of the main city. This is the back of the house across a pond, the front of the house that you see in the movie is actually a different building. It is not open to the public. This is about the time is started drizzling but never fear..."I have confidence in sunshine, I have confidence in rain" Does that include cold rain? There were these wonderfully smelling bay leaf trees being trimmed at Hellbrunn Palace. I had never seen a bay leaf tree before. Next was our drive through the countryside and Salzkammergut Lake district on the way to Mondsee which I'll get to in a minute. All the while Martina played the SOM soundtrack. However cheesy it was, Megan and I were lovin every minute of it. We had to stop in the countryside to have The Hills Are Alive moment. Thank goodness it has stopped raining. Eric sorta participated with some mild convincing. Next was a lookout area in the Salzkammergut Lake district. Then we headed to Mondsee which means moon lake. This is where the church in the movie is where Maria and Captain Von Trapp got married. It was just beautiful. And look at the chevron pavement... way ahead of the trend apparently! 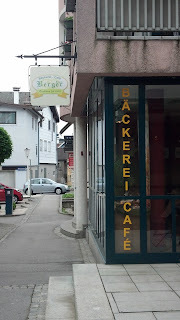 We had lunch in the small quaint town of Mondsee at a bakery. The lunch food (sandwiches and soups) was good but the pastries were even better. We did have our first taste of beef goulash. Next we continued on our drive to Hallstatt, a small (think 900 people) lakeside town also in the Salzkammergut. It is know for its production of salt and has the worlds first known salt mine. We strolled around the town streets with cute little shops and went in many of them. We bought some soap for our niece that was in fun animal shapes. We also tried samples and bought some more desserts in dessert shop. We walked up a hill from the main town to where the bone house (Beinhaus) was. They do charge you to enter but it is only like a Euro. This is looking back at some of the stairs you go up. It's a pretty good climb to the top. I'm not gonna lie, it's a tad creepy. The "house" is like 10 feet by 20 feet maybe. There are over 1200 skulls and they all have the date of the deceased written on them. This was started as the cemetery in Hallstatt was small and full and cremation used to be forbidden so the skull was taken and exposed to sunlight weeks and bleached. This started in 12th century and the last skull to be added was in 1995. By this point it had started to rain again so we hurried back to the minibus to head back to Salzburg. We arrived back in Salzburg close to dinner time and had Martina drop us off at the grocery store near the apartment so we could get a few groceries before it closed and drop them back off at the apartment. In grocery stores in Europe you weigh your produce and get a printed sticker yourself in the produce section and stick it on your plastic bag before going to checkout. Very efficient! Then we took the bus to dinner. We wanted to go to Pizzeria Beccofino, an italian restaurant I had read a good review on one of the Rick Steves boards. We had told Martina that is where we were going and it turns out that Martina is good friends with the owners... small world. It ended up taking forever for us to find it because we didn't get off the bus at the right stop so we were starving when we finally arrived. The food and wine was delicious and the service was wonderful. The servings were large too. I had salad (not pictured) and gnocchi. It was nice and cheesy. We were all trying each others meals and everything tasted great. We got to speak to one of the owners briefly and she was so friendly. We also ordered two yummy desserts. Chocolate and caramel gelato with cookies. Cinnamon gelato with little cakes. 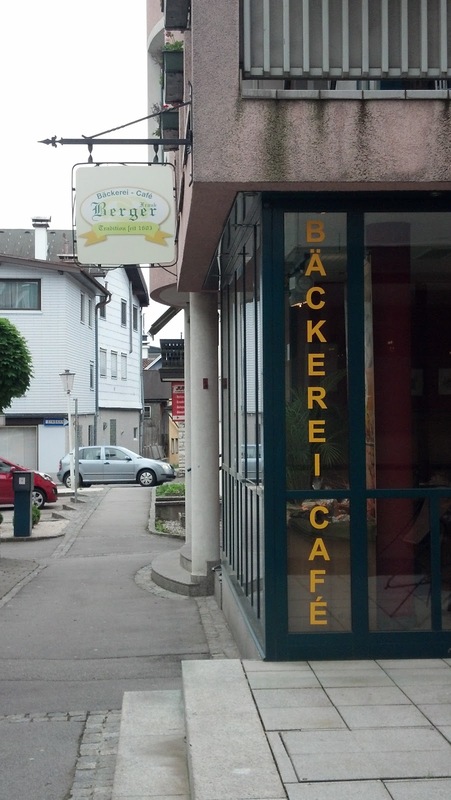 This was definitely our best meal in Salzburg! Highly recommend eating at Pizzeria Beccofino if you are there. It is at Rupertgasse 7, Salzburg 5020, Austria. Next up is our last day in Salzburg with a very rainy day trip to Berchtesgaden. Is it possible to visit vienna via land trip when in france? I really don’t have an idea about the place. though I heard a lot of good things about it, aside from the expensive cost of living. Well most of the european countries are. You would have to look at the train map and schedule to see what your options are based on where in France you will be. Vienna is a lovely city to visit!